No one knows how many veterans of the Great War are still alive. 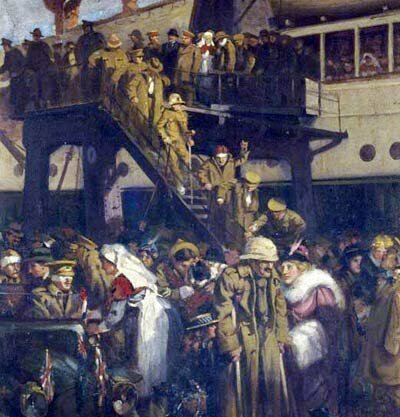 In 1918 and 1919 they came home, their bodies and souls scratched and wounded. Today just a few of them are still alive. In a couple of years time all eyewitnesses of the First World War will be dead. The majority of those who are still alive today were kid-soldiers. They joined the forces underage (below 18) and usually lied about their real age and sometimes also about their real name. Below some very old soldiers who faded away in the 21st century. Erich Kästner (left, undated picture) was believed to be the last remaining German soldier who served in the Great War. 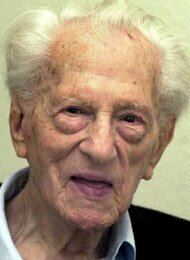 He died on January 1, 2008, in a nursing home in Cologne. He was 107 years old. Kästner had just graduated from high school in 1918 when he entered the army. Following training, he was sent to the Western Front to fight in France but was never sent to the front lines. Kästner rejoined the military in 1939 with the outbreak of the Second World War, serving as a first lieutenant in ground support for the Luftwaffe, primarily in France. Following the end of the war in 1945, he became a judge in Hanover. It is not sure that he was really the last German WW1-soldier. Germany does not keep track of its Great War veterans. Lloyd Clemett (left) from Canada was the youngest of a band of brothers to heed the call to battle and sign up to fight in the trenches of the Great War. 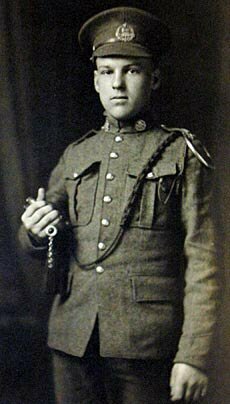 The enthusiastic teen set his sights on the battlefields of France, but three older enlisted siblings, his young age and fate ensured his safe return to Toronto when peace was declared on Nov. 11, 1918. On February 21st, 2007, Clemett died in the city where he was born, raised a family, and lived for more than a century. He was 107 years old. Like so many others anxious to join their countrymen in the trenches of France, Clemett told the army he was 18 — the official enlistment age — when he signed his papers in January 1916 (picture on the right). But he was only 16. Although Clemett’s true age was discovered in England, his older brothers also did their best to ensure their younger sibling was kept out of harm’s way. When his division was eventually shipped to Aubin St. Vast, France, Clemett volunteered for front duty. The day that the Armistice was signed was the day his battalion was supposed to go to the front lines. “Disappointed” at having never seen action in the war, Clemett returned home, along with his three brothers, and took a job as a railway agent. René Riffaud (left), the last surviving poilu (common soldier) from Normandy, France, died on January 15, 2007, in Tosny. Mr. Riffaud was 108 years old; he was born on December 12, 1898, in the village of Tabarka, in Tunesia. In 1917 Mr. Riffaud enlisted in the French African Army and was sent to Europe. He fought as an artilleryman in the Argonnes forest in the north-east of France, where he was affected by poisonous mustard gas. It was only in 2006 that he was added to the official list of French WWI veterans, after a campaign by his granddaughter. Moses Hardy (left), the last black American veteran of the Great War, died on December 7, 2006 in a nursing home in Jackson, Mississippi, USA. 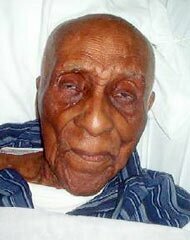 He was 113 years old and believed to be the second oldest man in the world. Census records showed Hardy's father was born in the 1830s and that both of his parents were slaves. During the war Mr. Hardy was in the 805th Pioneer Infantry Regt. He served for one year (from July 1918 to July 1919) in France and spent 39 days in combat. After the war he returned to his hometown of Aberdeen, where he farmed, drove a school bus and sold cosmetics. In 1999 Mr. Hardy was presented with medals and an honorable discharge by Brigadier General George S. Walker. Hardy had never received his discharge and the two medals he deserved. Mr. Walker gave him the Victory Medal and the Occupational Medal as well as the Legion of Honor - France's highest honor given to surviving members of U.S. armed forces who fought on French soil during World War I. In interviews mr. Hardy used to say that the only doctor he needed was Dr. Pepper. Léon Weil (left), one of the last French WW1 veterans, died on June 6, 2006 in Paris. He was 109 years old. 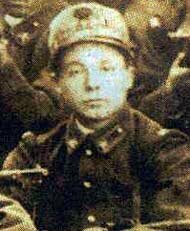 Monsieur Weil joined the French army in 1916, 20 years old (picture on the right). He took part in the Battle of the Chemin des Dames in 1917. Later he said: 'The hardest thing was to stay alive, something nearly impossible under the hail of German machinegun bullets." He didn't like talking about the war. "These are not very beautiful memories, they are all about deaths and casualties. It is to better to speak about love!" He himself was not harmed, but he lost two brothers in the war. After the war he became a famous boxer. 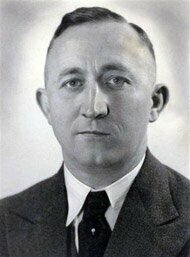 In the Second Worldwar he joined the Resistance and became the legendary intelligence agent 'Victor', stationed in Lyon. William Allan (left), the last Australian WW1 veteran, died aged 106 on 18 October 2005. 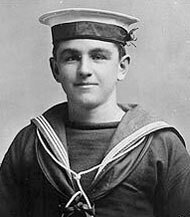 Mr Allan served in the Royal Australian Navy during both World Wars, having joined as a Boy Sailor at 14 years old. During most of World War I, he served on HMAS Encounter (right) , conduting patrols in the Pacific and Indian Ocean, and escorting troopships to Colombo. Mr Allan had a number of roles during World War II, including serving on the armed merchant cruiser HMS Moreton Bay, and as an instructor at HMAS Cerberus. He retired with the rank of Lieutenant in 1947. William (Duke) Procter (left), one of Canada's last veterans of the First World War, died aged 106 on December 14th, 2005, at the Oakside Manor residential care facility in Enderby. 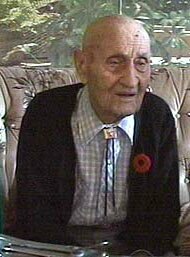 Born in Mable Lake, British Columbia on August 18, 1899, Procter volunteered for the army as a teenager. 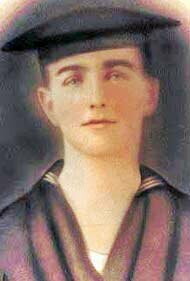 When he signed on in 1916, however, he was deemed too young for the active duty he craved. Instead, due to his skill with horses, he was deployed to a British bush camp where he cut timbers to be used in the trenches at Vimy Ridge. "I guess they needed workers as much as they did frontline men," he said in a recent interview. He was never sent into the trenches himself and he never fired a shot in anger. "I was very lucky. I got sent to places there was no war." Procter saw many of his comrades coming back from the front, dying or wounded. "All them that went into war and lost lives, or came back crippled or gassed - they're the ones you got to give credit to." Alfred Anderson (left), the last known British survivor of the 1914 "Christmas Truce" that saw British and German soldiers exchanging gifts and handshakes in no man's land, died in November 2005. He was 109. 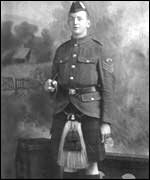 Born June 25, 1896, Anderson was an 18-year-old soldier (right) in the Black Watch regiment when British and German troops cautiously emerged from their trenches on Dec. 25, 1914. The enemies swapped cigarettes and tunic buttons, sang carols and even played soccer amid the mud and shell-holes of no man's land. The informal truce spread along much of the Western Front, in some cases lasting for days. "I remember the silence, the eerie sound of silence," Anderson told The Observer newspaper last year. "But there was a dead silence that morning, right across the land as far as you could see. We shouted 'Merry Christmas,' even though nobody felt merry. The silence ended early in the afternoon and the killing started again". Hermann Dörnemann (left) became 111 years old. 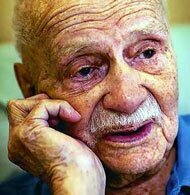 He was for more than three months the oldest man in the world. 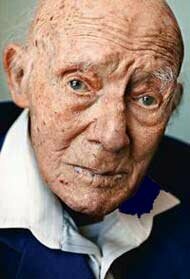 Then he contracted pneumonia and died on Wednesday 2nd February 2005, just three months before his 112th birthday. Dörnemann was born in 1893 in Germany, in the city of Essen. While serving on the front in World War 1 he suffered a gunshot in his right upper arm. Therefore he was excused from military service in World War II. He worked as an electrical engineer for utility company RWE AG for 42 years. He said that a little sweetened beer every day and the potato cooking water most people throw out were the secret of his longevity. He disapproved of any kind of sporting activities. The only exercise he ever believed in was "walking to the corner shop to buy beer and cigars". 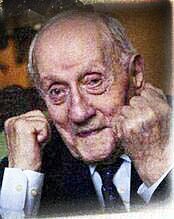 German veteran Charles Kuentz died, 108 years old, on April 7, 2005. The picture on the right shows him as a young soldier. 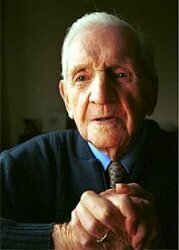 "From the time I landed in Belgium, a fortnight before my 19th birthday in June 1917, until I was wounded on October 23 that year, I never had a bath, never had a change of clothes. None of us was older than 21. We knew nothing of war. We alternated between four days and three nights in the trenches and then four days behind the lines to rest. You slept when you could. All the time you itched - we were covered in lice." 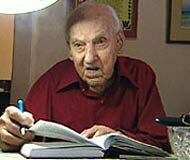 Kuentz gave about 40 interviews in the year before he died, but while he admitted to being a little tired, he also stressed that he had "a duty to bear witness" for future generations. "Pass on the memory of the Great War, because this tragedy must never be forgotten, otherwise it will happen again," he said. Tom Kirk (on the picture with his daughter June) died on Tuesday 9th November 2004. He was 106 years old. In 1917 he was called up to join the Royal Navy, from studies at Newcastle Medical School. After just weeks of training he was named surgeon probationer and posted to HMS Lydiard until the end of the war, when he returned to complete his medical training. In a newspaper interview just a few months before his death he told that the Lydiard spent several months escorting merchant ships across the channel, to and from France. During the winter of 1917, the destroyer also made expeditions to Norway, escorting convoys. "We had to look out for enemy submarines and also escorted the first batch of American soldiers from Southampton to Le Havre when the Americans joined the war. The Germans fired torpedoes at us a few times. Luckily, they never hit." Carlo Orelli (left), who was a well-known figure across Italy, enrolled in the Italian infantry when he was 12 (right). 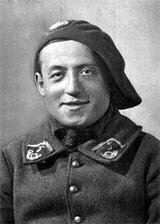 He was among the first Italian troops to fight on the Austro-Hungarian front. "In my brigade there were soldiers from all over Italy, peasants from the south who couldn't read or write, but who never complained. They died in silence... One day 330 of us went out and only 30 came back. I have never understood how come it didn't happen to me." 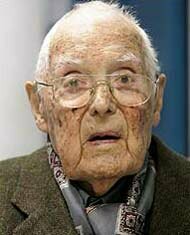 Mr. Corelli became 110 years old. He died on January 25, 2005. Marcel Caux (left) died on August 21 2004 in a nursing home in Sydney, Australia. He was 105 years old. 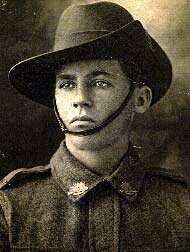 He was 15 when he joined the army in 1915. He used a different name (Harold Katte) and he told the recruiting officer he was 18. He was wounded three times. He did not mention the war for 80 years and only in 1998 began speaking out against it, according to his son, Marcus Decaux. "Peace is very important, especially after this disastrous war in Iraq we just had," he told reporters last year. He called upon the people to embrace peace and to despise war. "So many people have suffered because of war. It is better to have peace," he said. Mr. Caux also said it was difficult for him to attend Remembrance Day and ANZAC Day ceremonies and to remember those he knew during World War I. "All the people I fought with are dead." Newspapers reported that he had asked the Australian governerment to place an embargo on his war records, and also that he had destroyed all his WW1 photographs and documents. The American Mike Mansfield (left) became an important and admired public servant. He was a son of Irish immigrants. 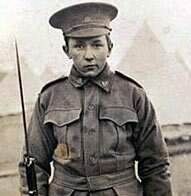 In 1917, fourteen years old, he quit school and tried to enlist in the armed forces, but he was turned down. He then went to the Catholic church where he had been baptized, obtained a copy of his birth certificate, and forged it to show that he was born a few years earlier. With these papers he was accepted in the Navy (right) and he crossed the Atlantic seven times before officers discovered he was underage and discharged him. After the war he worked in copper mines, then took high school, then university, became a professor in Far Eastern history and went into politics. He served 34 years in Congress, 24 of those in the Senate (Democrats). He presided over the Senate from 1961 to 1976, a time in America marked by strife over Vietnam, civil rights and White House scandals that brought down President Nixon. Later he was appointed ambassador to Japan. Michael Joseph Mansfield died on 5 October 2001. He was 98 years old. 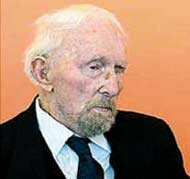 Arno Wagner (left) died in Germany on 22nd December 2004 at the age of 110. He apparently lost his lust for life after breaking his hip and not being able to return home to his appartment and his daughter Ingeborg. 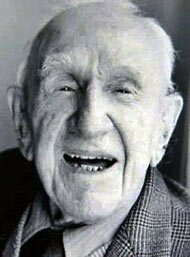 He was born on June 4th 1894. 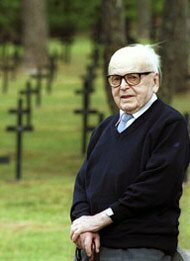 Many people know him from a recent German television documentary about Verdun. 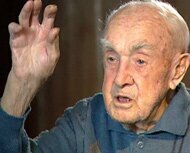 In this documentary the old veteran told how served as an artillery observer in balloons. He directed German gunfire and watched the French movements on the battlefields. He used a telegraph apparatus to send his observations to the German forces below. After 1945 he worked as an accountant in East Germany. Alec Campbell (left) was an Australian boy who lied about his age. He enlisted as a 16-year-old (right). "In those days if you were big enough you were good enough", he recalled later. "They didn't really care about your age." Alec fought in Turkey, where his comrades nicknamed him The Kid. He remembered an "incredible hail of bullets" on landing at Gallipoli, where he was set to work ferrying water in the trenches, sleeping in a "cold, damp hole in the ground". Six weeks later he was too sick with enteric fever to fight and he was invalided home. 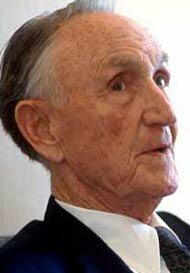 Alec Campbell died in Hobart, Australia, on 16 May 2002. He was 103 years old. Emile Brichard (left) died on July 8th 2004. He was 104 years old. Mr. Brichard was the last living Belgian WW Iveteran. In an interview with a Dutch newspaper a few days before his death he told how he worked in a field hospital as a nurse. "One big drama it was. All day I was busy with corpses. Shot, lethally wounded, they came in. Very seldom one came out alive." Brichard himself came out healthy. He became a miner and a famous cyclist. In 1926 he took part in the Tour de France (picture on the right). Mr. Brichard was married three times and outlived all his wifes. He could still read his newspaper without glasses. Australia's oldest WW1-veteran ever, 107-year-old Peter Casserly (left) finally succumbed to the inexorable march of time. He died on June 24, 2005 at his Perth nursing home. He had enlisted at 19 (right) in Fremantle, and was soon lugging ammunition and building fortifications on the battlefields of Amiens, Armentieres and Ypres in France. His horrific wartime experiences ensured he was a vocal and lifelong opponent of war, which he described as "just one great big tragedy". Confined to a wheelchair, blind and almost completely deaf at the time of his death, his health deteriorated steadily in his last years. He refused to take regular medication and was partial to a cold beer until the end. More on the Boy Soldiers of the Great War. Back to the Frontpage of the The Heritage of the Great War.